John D. McCaffery, M.D. is an otolaryngologist who has been treating children and adults for more than 20 years. Dr. McCaffery has offices in Santa Barbara and Santa Ynez and is on the staff of Santa Barbara Cottage Hospital, Goleta Valley Cottage Hospital, Santa Ynez Valley Cottage Hospital and the Santa Barbara Surgery Center. He is also a past chairman of the Department of Otolaryngology for Cottage Health Systems. Originally from Michigan, Dr. McCaffery earned his Bachelor of Science from Washington & Lee University and his medical degree from Vanderbilt University. He also has a Master of Science from the University of Minnesota, which he earned while studying the molecular biology of head and neck cancer. Dr. McCaffery completed an internship in general surgery at the University of Minnesota. He also completed an additional rotating year of plastic and reconstructive surgery and general surgery (including cardiovascular, transplant, facial trauma, neurosurgery and orthopedics) in preparation for his residency. He then completed a four-year residency in otolaryngology-head and neck surgery at the University of Minnesota Hospital and surrounding clinics. Dr. McCaffery is a Fellow of the American Board of Otolaryngology and a member of the American Academy of Otolaryngology-Head and Neck Surgery. Before moving to Santa Barbara, Dr. McCaffery practiced in the suburban Detroit area for three years. During his time in Nashville and the Detroit area, he worked with a number of recording artists and gained experience caring for industry professionals. He has continued this work in California with a number of recording artists, actors and voiceover artists. While Dr. McCaffery enjoys the pediatric aspects of otolaryngology, he is interested in otology, sinus disease, endoscopic surgery and facial reconstruction following Mohs Microsurgery for head and neck carcinoma. He also has considerable experience in the use of Botox for the treatment of laryngeal spastic dysphonia. 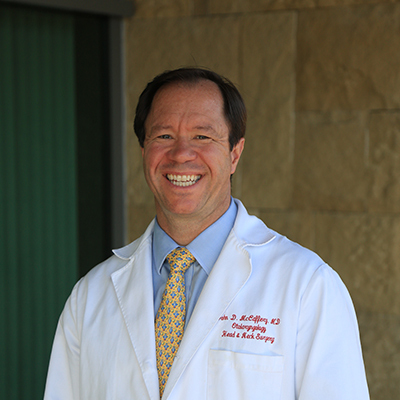 Dr. McCaffery has lived in Santa Barbara with his family for more than 15 years. He is married with three children. In his community, Dr. McCaffery coaches youth sports and volunteers with schools and local organizations. In his free time, he enjoys sailing and fishing. Dale Amanda Tylor, M.D. is an otolaryngologist and former faculty member at Vanderbilt University, where she instructed medical students, residents and fellows on the care of children with ear, nose and throat problems. 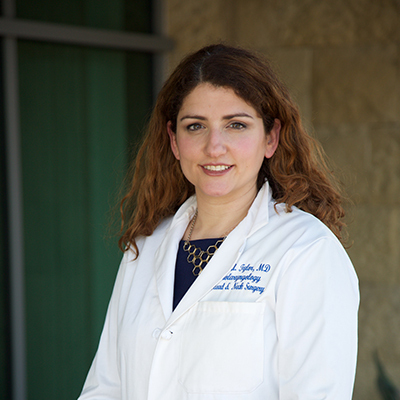 She joined ENT Associates of Santa Barbara in 2017 and specializes in treating children for ear and hearing issues, with minimally invasive management of the head and neck. Originally from Montreal, Canada, Dr. Tylor attended medical school at McGill University in 2002 before transferring to the University of Florida in Gainesville, where she completed a General Surgery internship and Otolaryngology-Head and Neck Surgery residency in 2007. She then elected to pursue further specialized fellowship training in Pediatric Otolaryngology-Head and Neck Surgery at Rady Children’s Hospital in San Diego before joining the faculty at Vanderbilt. Dr. Tylor enjoys running, snowboarding and traveling.